Carnival Breeze is the third and final “Dream”-class ship added to Carnival Cruise Lines’ fleet, and it was launched in 2012. It was constructed by Italian shipbuilders Fincantieri, with the Dream-class series representing some of the largest passenger ships the Italian company has ever created. The Carnival Breeze offers a host of attractions, including a 4D cinema, whirlpools and a water park, and its exterior promenade measures half a mile in length. The water park, named the WaterWorks, features a 300-foot (91-meter) corkscrew water slide known as the Twister together with another slide called the Drainpipe. Carnival Cruise Lines boasts that passengers will experience the “hottest new spaces” on their way from Miami to the Bahamas and the Caribbean, and the Carnival Breeze showcases the company’s focus on food, drink and entertainment. On this ship, Carnival Cruise Lines parted from previous head designer Joe Farcus and instead chose to work with Hamburg-based Partner Design, who replicated an easy-going Caribbean setting, complete with palm trees and driftwood-style signage. The design has been described as “less schizophrenic” than some of the over-the-top styles that have previously been associated with the cruise line. Despite its name and Scandinavian ownership, the Norwegian Breakaway has New York City at its heart. A marketing image on the ship’s official website depicts it with the buildings of New York’s skyline on its top deck, set above the colorful mural of the Big Apple emblazoned on its hull. Norwegian Breakaway, which was named through a public competition, is the fifth-largest cruise ship in the world and the largest to be home-ported in New York. 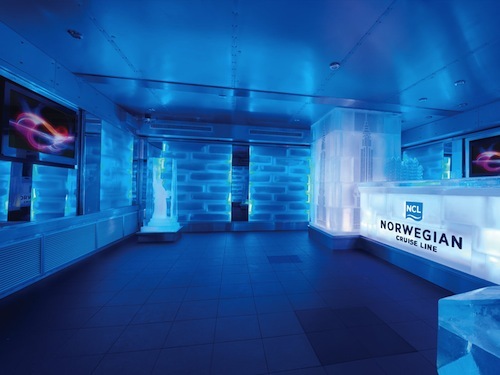 One of its more distinctive elements is the Ice Bar, which is kept at a constant 17°F (-8°C) and features ice sculptures of New York landmarks the Brooklyn Bridge, the Statue of Liberty and the Chrysler Building, as well as specialty NYC-themed cocktails. 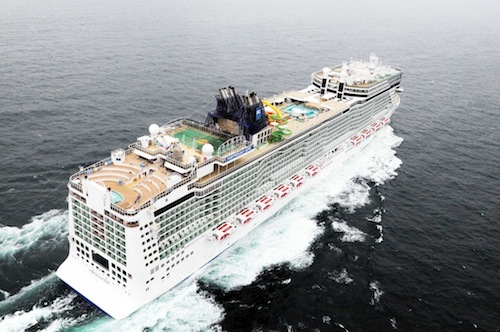 Norwegian Breakaway is set to be joined by a sister ship, the Norwegian Getaway, in early 2014. And following an excellent response to the Breakaway from the press, travel agents and guests, Norwegian Cruise Line has also already commissioned two vessels in the second-generation “Breakaway Plus” class, with the first ship due for delivery in 2015. Celebrity Reflection joined the Celebrity Cruises fleet in late 2012 as the last of the company’s five “Solstice”-class cruisers – which have been described as coming “from the minds of the world’s top designers and architects.” The ship, which accommodates more than 3,000 guests, is the only vessel in the Solstice class to feature the luxury two-bedroom “Reflection” suites. 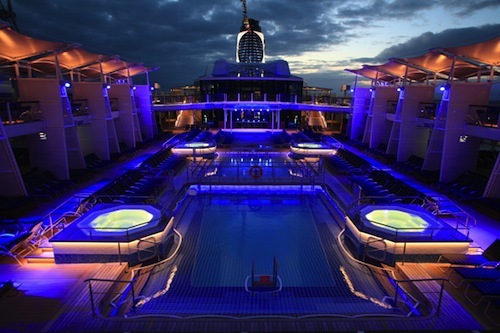 It also showcases the first of the company’s “AquaClass” suites, and an extra deck compared to its sister ships, as well as some stunningly lit pools, like that seen in the image above. In addition, the ship promotes creativity with its Art Studio, where passengers can learn from two “master artists” about jewelry making, painting and even the world of drink mixology. The Celebrity Reflection’s 2013 itinerary offers summer Mediterranean sailing from Civitavecchia in Rome and Caribbean sailing leaving Miami in the winter. 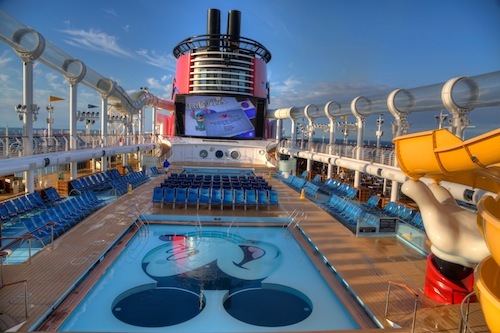 Disney Dream is the Disney Cruise Line’s third cruise ship and was launched in 2011. The ship’s horn plays an array of classic Disney songs, including “Be Our Guest” from Beauty and the Beast and “Yo Ho (A Pirate’s Life for Me),” the theme song for Disney’s Pirates of the Caribbean theme park attractions. 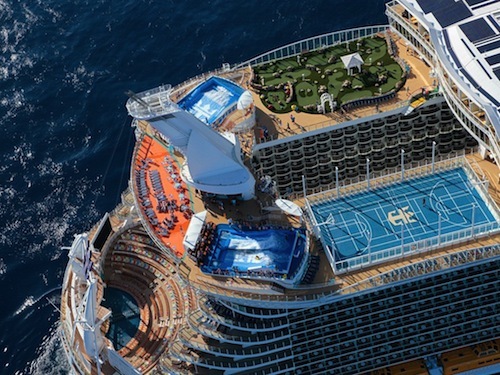 During its three- to five-day trips to the Bahamas, the ship offers a range of activities, among them a mini-golf course with nine holes, a walking track, and a full-size basketball court that can double as a soccer pitch, table tennis space or volleyball court. 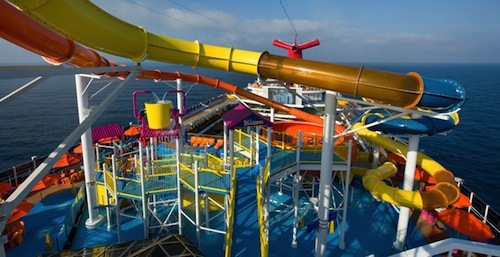 However, arguably the highlight is the AquaDuck, a 765-foot-long “water coaster” that drops down four decks and extends 13 feet over the edge of the ship and across the front funnel. For those wanting an escape from the kids, though, there’s also the grownups-only Quiet Cove Pool, featuring a bar. On June 13, 2013, the Royal Princess was christened, fittingly enough, by the Duchess of Cambridge. However, the ship was actually named after its illustrious seafaring predecessor, which was launched in 1984 and is no longer in operation. The 1,083-foot-long vessel was built by Fincantieri in Italy and is operated by California-based American-British company Princess Cruises. 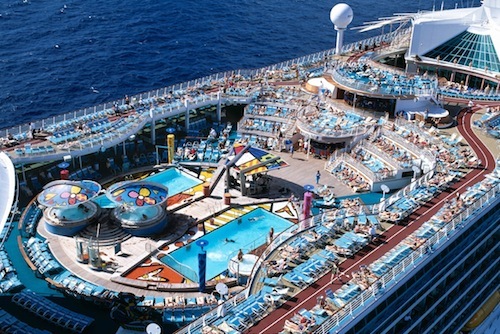 It features the company’s largest top-deck pool, even if overall the ship has fewer pools than others in the Princess fleet. As well as a water and light show available to them, passengers can enjoy the ship’s poolside “Movies Under the Stars” screen, and a glass-bottomed walkway that offers views of the sea 128 feet down below. Interior design for the ship was handled by Genoa-based architect Giacomo Mortola and Princess Cruises’ vice president of interior design Teresa Anderson. 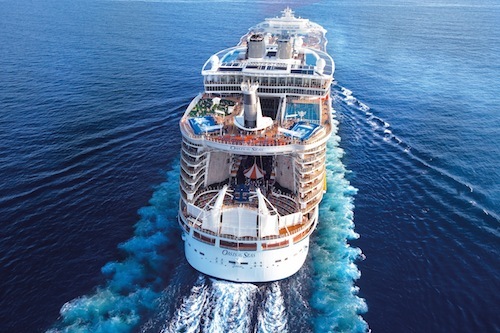 The MS Allure of the Seas holds the record as the largest passenger ship ever made, nudging its sister ship, the MS Oasis of the Seas, into second place by a mere two inches. Its “godmother”, Shrek’s Princess Fiona, formally named the vessel on November 28, 2010. 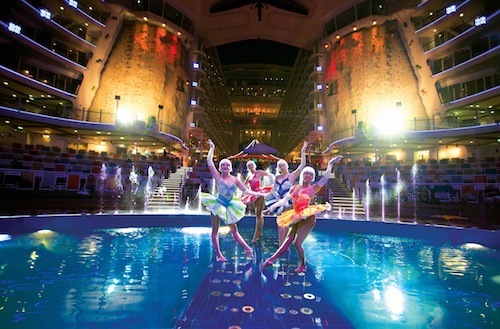 According to Royal Caribbean International, the ship provides an “unrivalled host of on-board experiences.” A two-deck dance hall, a 1,380-seat auditorium and an ice-skating rink are just some of the attractions on offer. Within one of the seven separate “neighborhoods” is the self-declared “first park at sea,” which features more than 12,000 plants. Anglo-Italian muralist Clarissa Parish was also brought on board to decorate many of the interior walls. 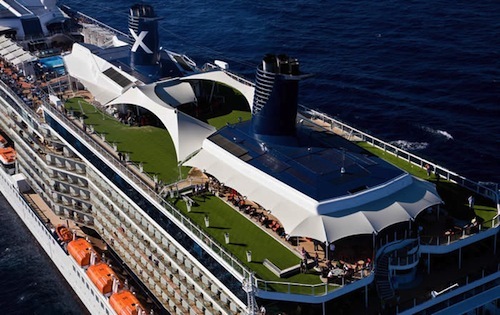 In 2008 Celebrity Solstice became the first “Solstice”-class ship to be added to Celebrity Cruises’ fleet, although it was soon followed by four sister ships: the Celebrity Equinox, Celebrity Silhouette, Celebrity Eclipse and Celebrity Reflection. Luxury amenities on board the Celebrity Solstice include a theater that seats over 1,400 people, and the Lawn Club – a real grass lawn on the upper deck that features a putting range, bocce courts and the “Hot Glass Show,” where passengers can watch intricate works of glass art being created. The ship’s design has gained plaudits, with Cruise Critic describing it as possessing “one of the best interior architecture designs” the website has ever seen. In 2009 the ship was prominently featured at the International Interior Design Association’s “Pioneering Design Lecture Series” in New York. The Norwegian Epic first set sail on July 10, 2009. When it was built, it was the third-largest cruise ship in the world and Norwegian Cruise Line’s first “mega”-class vessel. The craft quickly made an impression, winning the accolade of “Best Cruise Ship” from Travel Weekly in 2011 and 2012. Norwegian Cruise Line describes it as “freestyle cruising on a truly grand scale.” On-board entertainment includes performances from the Blue Man Group, Cirque Dreams & Dinner, an ice bar, a rappelling wall, and a water park. As with all Norwegian Cruise Line’s modern ships, the Norwegian Epic can be spotted from a distance thanks to its distinctive bow art. 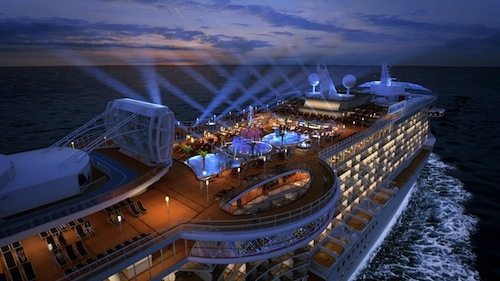 In 2009 and 2010, Royal Caribbean International’s “Freedom”-class ships were replaced by the company’s new “Oasis” class. First out of the dock was the MS Oasis of the Seas, which was the largest cruise ship in the world when it made its maiden voyage on December 5, 2009 – although it was eclipsed by its sister ship the MS Allure of the Seas a year later. The Oasis of the Seas, which has been described as “an entire water-going city,” has capacity for 8,500 passengers and staff. It boasts an array of entertainment and sports attractions, including a zip-line, a casino, miniature golf, volleyball, basketball, and five swimming pools. Yet possibly one of the ship’s most distinctive aspects is the fact that activities are split, theme park-style, between several themed “neighborhoods.” At the ship’s naming ceremony, “godmothers,” among them Gloria Estefan and Jane Seymour, sponsored each area. Liberty of the Seas was launched in 2007 and is one of Royal Caribbean International’s three “Freedom”-class cruisers. And this impressive ship was upgraded in 2011 to contain a host of new features. 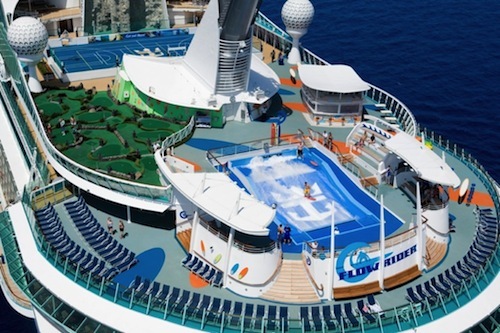 Royal Caribbean International’s Freedom-class ships put the spotlight on sports and athletics, and the Liberty of the Seas includes a FlowRider on-board wave creator, a boxing ring, an ice-skating rink, and a full-size court for volleyball and basketball. Its two cantilevered whirlpools – which stick out from the deck of the ship and offer striking views of the sea – are also a highlight. Artist Clarissa Parish again provided murals for many of the ship’s interiors.